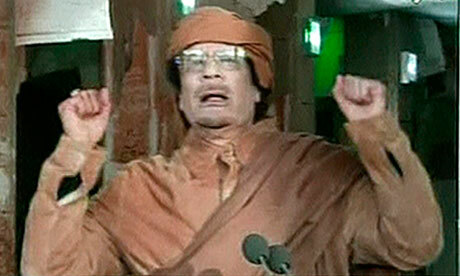 Today marks day seven for the turmoil in Libya. The UN Security council met today to discuss the fragile situation in the country. Our State Department has remained pretty quite on the issue, barely making any comments. Secretary of State Hillary Clinton said Tuesday that the U.S. is watching the situation in Libya “with alarm” and condemned the violence. President Obama has yet to make an official statement. The U.S. is relying on Human Rights groups to keep track of the violence and the deaths in the region. As of today, an estimated 250 lives have been claimed due to the outrageous violence and instability of the Libyan leadership. Many bodies still line the bloody streets of Tripoli. Amazingly, some of the deaths have come from their own government which had warplanes opening fire on protestors. 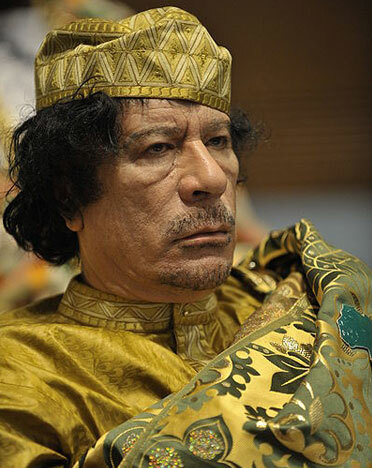 Muammar al-Qaddafi has been in power since 1969, which is 42 years now. That is the longest time for any Arab leader. He announced today, in a speech given from his old house that was bombed by American war planes in 1986, that he has no plans to step down. It was his way of showing that he had fought the Americans and suffered losses for Libya. The attack killed his adopted daughter. During his rant, he vowed to “die a martyr” in Libya as the “head of the revolution.” He also noted that if the fighting continued, Libya would be attacked by America. Meanwhile, Qaddafi is encouraging supporters to “take your kids to the streets and die for the freedom of Libya. It is for a good cause,” he says. The problem is, that his supporters are fading fast, and his regime is on the brink of collapse. Members of his own regime are turning against him, as he sends the military out to murder some of his own forces. 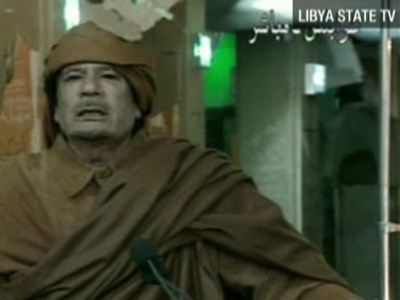 Some Libyan military officers are urging soldiers to help remove him from power. Earlier, two war planes were issued to bomb Libyan citizens. The pilots of those planes instead landed on Malta, hoping for aslyum. Others, carried out the orders. Moreover, the Libyan Ambassador to the United States said on a TV interview, that he no longer supports the regime and now represents the Libyan people. He even accuses Qaddafi of genocide. Diplomats there have been quiting in droves, many asking the government to stand with the people. In Tunisia and Egypt, protesters were able to topple their governments quickly and with relatively few incidents of violence, a prospect that may not be as likely in Libya, where Qaddafi has sent war planes to attack demonstrators and has met calls to respect protesters with accusations of U.S. meddling and incitement, states Fox News. “We believe that the government of Libya bears responsibility for what is occurring and must take action to end the violence,” Clinton said. While we all sit on the sidelines and wait for Libya to end their own violence, the question becomes, how long will it take for defiant Qaddafi’s own military turn on him? 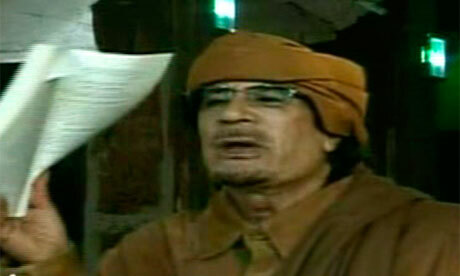 Ken Timmerman, who interviewed Qaddafi in 2004 thinks it will be soon; maybe even tonight. If that happens, who will keep this country from descending into chaos? I wonder if they will turn into a country without a government full of instability, just like Somalia. Gosh, that would be horrible. 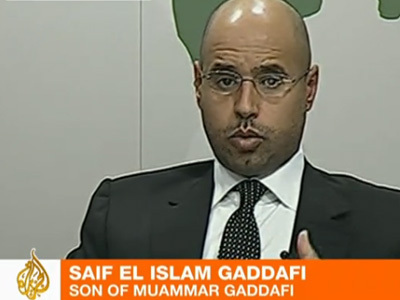 I’ll pray this doesn’t turn into a Civil War like Qaddafi’s son (pictured below) has predicted.